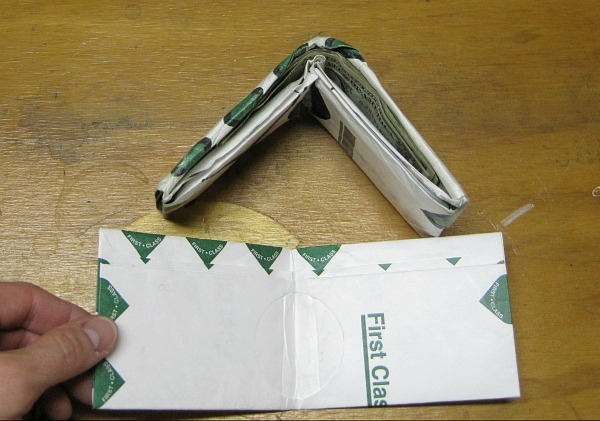 When looking for a new wallet, not many people look at an envelope as an option. Ok, there may only be a handful of us crazy enough to actually think this. But a single Tyvek envelope can be transformed into an everyday wallet and hold up to daily wear and tear for over two years. Just like with a leather wallet, the corners and the fold have seen the most wear. At the bottom of the fold, there are now a couple of small holes in the Tyvek that have formed. That is really the only part of the wallet that has seen excessive wear. Once put into everyday use, the Tyvek softened up and was no longer “crinkly”. The wallet holds cash, multiple credit cards, driver’s license, business cards, and a few other miscellaneous cards without being overloaded. Sure, the Tyvek looks goofy and it’s even worse with my artwork, but when stuffed with all of those cards and cash, it’s still 1/3 or 1/4 the thickness of a traditional leather wallet. This is the main reason for using a Tyvek wallet. Some days, I forget I’m carrying the wallet when I start wrestling with my kids. A leather wallet would let you know it’s there as soon as you get tackled by two kids and end up landing on your wallet side. At this point, I’m hooked on the Tyvek wallet and it will continue to be my daily wallet. Maybe in another 6 months, I’ll need to make a new one, but 3 years of wallet use from a mailing envelope is a great lifespan. Plus, this time I’ll get to practice my artistic, or should I say lack of artistic, abilities on another wallet. As far as the design, I don’t plan on changing anything regarding the folding or pockets on the wallet. They have worked very well since I figured out the best way to organize the cards within the pockets and sleeves in the wallet.